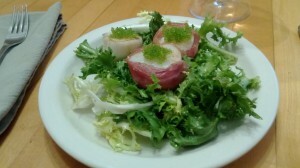 Made this appetizer w/ some friends and thought I’d share the photo that one of my friends snapped that evening. This dish used to be on the menu at Remy’s back when Ben Davis and Ivy Magruder were the chefs there. It’s a delicious way to start off a great meal! We had red wine braised swordfish w/ roasted fingerling potatoes and sautéed Swiss chard for our main course. Dessert was fresh berries w/ cookies. Wines of evening were a 1986 Chateau Mouton Rothschild Pauillac w/ dinner and a Mount Pleasant port w/ dessert. Thank you Paul and Laurie for bringing these great wines! !